Short on ideas of where to go, what to do? Then have a look here and see if there is something that suits your mood! We have prepared some ready made itineraries for you to enjoy, whether its walking, cycling or places to visit, let us help you plan your perfect day. At 21 miles this is one of the longest cycle routes in the area. The cycle route passes through the lovely Ainsdale National Nature Reserve, through Formby and Hightown to Crosby for spectacular views of the 'Iron Men'. Why not hire a bike from the hire centre at Southport Station as bikes can be taken free of charge on Merseyrail trains. Hire costs for the bikes are £6 for up to 4 hours or £10 for the full day. From Southport Station travel south to Crosby and alight the train at Waterloo Station, as you exit the station turn left and ride down South Road towards the sea. 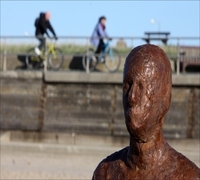 From here you can ride along the coast and have spectacular views of the Anthony Gormley statues, 'Another Place', or the Iron Men as they are popularly referred to. Crosby Lakeside Adventure Centre is a great place to visit whilst you are in Crosby. The Lakeside Bar & Bistro offers a contemporary British and Pan-European menu served within a relaxed, infor mal setting. All the food is of the highest quality, locally sourced and delivered fresh daily, prepared to order, ensuring a quality dining experience every time. Children are never overlooked and can enjoy their very own special menu. If you are feeling fit then you could ride both ways, however, its easy to ride one way and get the train back. Calling all 'Twitchers' or budding bird watchers. A short cycle ride from Southport Station takes you to the RSPB Marshside Nature Reserve. The reserve is open from 8.30am to 5pm every day and entrance is free! Did you know how easy it is to get there from Southport? Well if not, its well worth a day out. Firstly, what might you see there? Well the RSPB Website gives the full up to date details, but here is a taster to whet your appetite. The reserve boasts something for everyone all year round. From brown hares boxing in the spring to nesting birds in early summer, and in winter the skies are full with visiting waterfowl, such as pink-footed geese and wigeons. There are even birds of prey if you prefer. There are two hides, a viewing platform and three viewing screens. If you're new to birdwatching, why not visit the reserve on one of their extensive special event days aimed at beginners as there are birds at the reserve all year, and plenty of them! Entrance is free, however, donations are always welcome. So, how might you get there? Well come on the train to Southport. Trains from Liverpool on the Merseyrail line run every 15 minutes and you can bring your bike for free. If you don’t wish to bring your own bike then once at the station you can hire a bike from the hire centre. The reserve is a 10 to 15 minute cycle ride away. A new cycle route along Marshside Road, and a controlled crossing point, gives even easier access. Maps are available from the hire centre and the staff will be more than happy to assist you to plan your route to the reserve. And finally, before you leave, why not take advantage of the many places to eat and drink in Southport. From fast food to a light snack, from lunch to an elaborate dinner, there is something for every occasion, taste and pocket. The bustling market town of Ormskirk is well served by public transport. The train station is on the Merseyrail Northern Line and trains run every 15 minutes. The bus station is in the centre of the town and is served by buses from Southport, Preston, Skelmersdale and St Helens to name but a few. Ormskirk offers a wealth of shopping, socialising and sight seeing. The famous market dates back to 1286 when monks at nearby Burscough Priory were granted a Royal Charter by Edward I. The market brings an added buzz to the cobbled streets every Thursday and Saturday. The Town Centre is pedestrianised so you can stroll safely around. Don’t forget to have a look at the famous Grade-II listed Clock Tower, which was built in 1876 in dramatic ‘gothic’ style. Overlooking the town is Ormskirk’s Parish Church, architecturally one of Eng land’s most unusual churches, as it is one of only three with both a tower and a spire. The steeple dates back to the 15th century, with the massive tower added on a century later. Why not combine your trip with a wonderful walk on the Yellowhammer route. The 7 mile walk takes you out to Clieves Hill and the beautiful vistas over the countryside to the Sefton Coast. Mainly using the public rights of way network you eventually come back through Coronation Park and into the town centre. The walk is just over 7 miles long. Taking almost 40 years to complete and connecting the Cities of Liverpool and Leeds, the Leeds & Liverpool Canal at 127 miles is the longest canal in Britain built as a single waterway. Following a £22 million facelift, and the creation of the Liverpool Canal Link, the canal link opened to boats in April 2009 and extends right into the heart of Liverpool and its historic Albert Dock. This stretch of canal travels along the city’s historic waterfront, passing museums, restaurants and galleries making it a great option for a family day out. The canal also passes many listed buildings on its route into Liverpool including the photogenic Three Graces. The canal has a lot more to offer than this though. Why not walk or ride north into the Sefton area and out into the wonderful countryside. Passing a wealth of places to eat and drink, the magnificent Aintree Racecourse, the nearby Farmer Teds Farm Park and Burscough Wharf, to name just a few. The Rufford Branch takes you off to the Marinas and the magnificent Rufford Old Hall, a National Trust property. You can also explore the canal in bite size chunks, and don’t forget that you can access areas by rail. The nearest railway stations to the canal in our area are at Waterloo, Old Roan, Maghull, Burscough Junction, Burscough Bridge, New Lane and Rufford for the Rufford Branch of the canal. Bikes are carried free of charge and without booking on the Merseyrail network. The Visit Travel Map may help you to decide how to manage your visit, it is available through the link or alternatively, get in touch and a copy can be posted to you. The canal is also being used as part of our Pier to Pier Route. Running between Southport and Wigan, the route accesses the canal as Scarisbrick and continues east to Wigan Pier.